All the training courses by Dr. Ch'ng Huck Khoon are eligible for HRDF claims under the Skim Bantuan Latihan (SBL) Scheme, subject to prior application to HRDF by the employers/companies. Companies that contribute to the Human Resource Development Fund (HRDF) are entitled to obtain a training grant from HRDC under the Skim Bantuan Latihan (SBL) scheme or SBL-Khas Scheme. Application is subject to HRDC's approval. 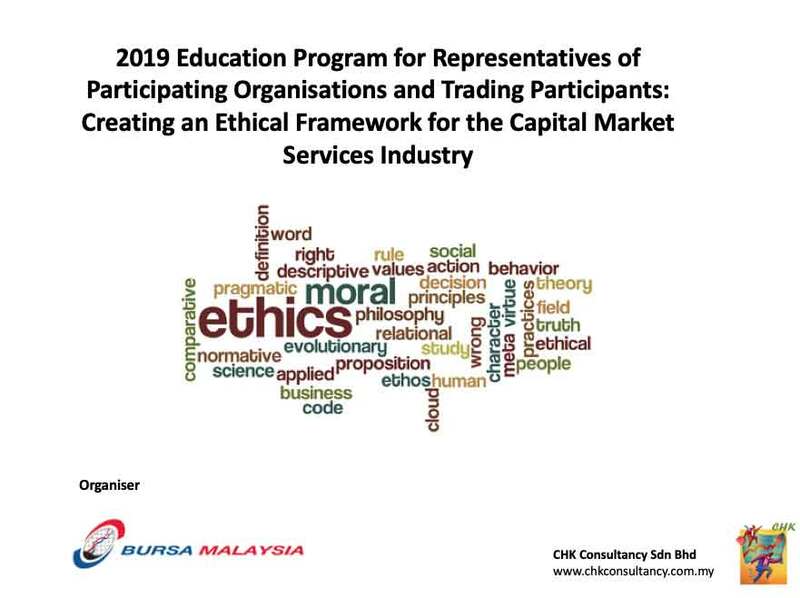 2019 EDUCATION PROGRAM FOR REPRESENTATIVES OF PARTICIPATING ORGANISATIONS AND TRADING PARTICIPANTS : "CREATING AN ETHICAL FRAMEWORK FOR THE CAPITAL MARKET SERVICES INDUSTRY "
Download the Registration Form to register for the course. Create awareness on regulatory issues, code of ethics and promote higher standards of business conduct of Representatives . Improve the standard of compliance to the requirement of the rules and regulation particularly on trading activities as well as instill a culture of self-regulation amongst the Participating Organisations / Trading Participants and their registered persons. Understanding the existing regulations, rules, directives and guidance issued by the Bursa, Securities Commission (SC) and Bank Negara Malaysia (BNM). Describe the Code of Ethics and regulatory framework governing the capital market intermediaries. Apply appropriate techniques to gain customer’s acceptance for the proposed products or services. Identify capital market activities that are allowed and restricted, including limitations for the allowed activities. This seminar is SIDC Accredited and carries 10 CPE points. What does an ethical capital services industry look like? Discussion: Is enforcement the right focus point? 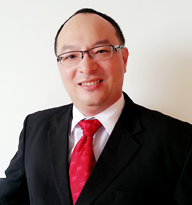 Dr. Ch’ng Huck Khoon, pursued his PhD studies in Finance at the Universiti Sains Malaysia (USM); He also holds a MBA (Finance) from the University of Stirling (UK), he is an Associate Member for Centre for Business and Management (CBM) University Tunku Abdul Rahman (UTAR). Dr. Ch'ng is the Independent Non-Executive Director and Chairman of Audit Committee of CNI Holdings Berhad and YGL Convergence Berhad and AT Systematization Berhad. All of which are listed on Bursa Malaysia Securities Berhad. 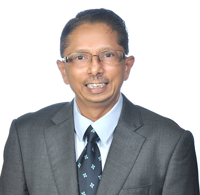 Mr. Pankajkumar Bipinchandra, graduated with Bachelor of Accounting with an Honors degree from University of Malaya and in 2014 also obtained an MBA in Finance from the same University. His last worked as the Director, Head of Corporate Strategy & Investments at a large conglomerate, a position he held between Oct 2012 and early June 2018. Prior to this, he was the Chief Investment Officer at Kurnia Insurans Malaysia Berhad between 2005 and 2012. Clement Almaide A/L A M Francis, joined Malaysia Singapore Stock Exchange as a Trainee in 1972 and later Posting Clerk (Boardwriter). In 1973, due to the split within Exchange, transferred to the newly established Kuala Lumpur Stock Exchange as the previous position. He made the Floor Supervisor of the Kuala Lumpur Stock Exchange in 1983, supervising 350 Floor Traders and 15 Boardwriters. 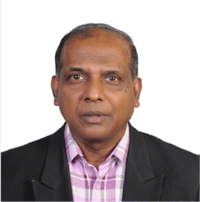 In 1987, he made the Head / Floor Manager supervising 500 Floor Traders and 50 Boardwriters / MASA Operators of the Kuala Lumpur Stock Exchange until August 1994, 22 years in service with the Exchange.